1.1 A child’s dental care should start BEFORE they even have teeth. 1.3 Which is the best toothpaste for kids? You needn’t be worried about taking your child to the dentist for the first time but do you know you can prepare your child’s teeth in advance for your children’s first ever visit to the dentist or in between anxious visits and check-ups? 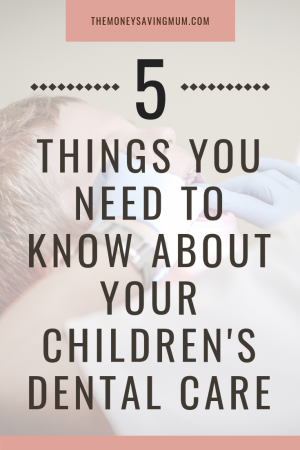 Check out these 5 things you may not yet know about your children’s dental care. A child’s dental care should start BEFORE they even have teeth. In the UK, Mums get free dental care up to your child turning 1 so make the most of it and ensure you take your baby with you and make you own dental clinic your children’s dental clinic too. If you’re just having a check-up sit the baby on your knee; this will help them get used to the environment and if the dentist is a pediatric dentist they may even have a quick glance at your child’s gums or teeth if they have any whilst you are there. NHS dental care for children is FREE so take your child for their first check-up when the first milk teeth appear. It’s so easy to say yet very difficult (for some) to follow through with.. I’ve been there! But it’s a fact that this doesn’t help kids dental care whatsoever because the sugary milk pools in the teeth and gums and stays there so should be nipped in the bud ASAP or if at all possible not even considered at all as an option to get your child to sleep. Same goes for rusks… did you know that even in the reduced sugar rusks there is just 1g less of sugar that is in a chocolate digestive biscuit. It’s common for parents to put rusks in baby milk too to ‘fill them up’… but you are then creating twice as much sugar to form in those milk pools so is something you may want to reconsider. Offer more food during the day or when snacking, give them things with natural sugar in them such as fruit or no sugar at all (rice cakes/crisps). Which is the best toothpaste for kids? Don’t go for the overpriced ‘aimed at children’ toothpaste when you can pick up a family one for half the price. As long as it is within the PPM of fluoride below (and as shown on the NHS website) any toothpaste is fine. Children up the age of 3 can use children’s fluoride toothpaste containing no less than 1,000ppm of fluoride (check label) or family toothpaste containing between 1,350ppm and 1,500ppm fluoride. Use children’s fluoride toothpaste containing no less than 1,000ppm of fluoride (check label) or family toothpaste containing between 1,350ppm and 1,500ppm fluoride. Children aged 7 and over can use fluoride toothpaste containing between 1,350ppm and 1,500ppm of fluoride. Ensure you teach your child to not rinse whilst brushing. Spitting out is fine but when you rinse and bring water into contact with the fluoride it will not work as well as it should. I think that although this is quite an obvious tip when it comes to your children’s dental care and IS something you can do to help your childrens teeth; you can’t avoid sugars completely. Ensure after they’ve had something sugary they brush their teeth immediately. Like they should anyway, ensure they brush their teeth before bed particulary if they have had something sugary for supper. I hope this helps.. feel free to share with anyone you feel would benefit from this post. Previous Post Easter M&S hamper giveaway!